Get outside and play...with your family! Forever Wild Adventures is dedicated to inspire experiential learning and unstructured play in the out-of-doors. Through Forever Wild Friends events, adults come together to have fun outside and deepen the community bonds where they live. Forever Wild Play Days are designed to facilitate one-of-a-kind, hands-on memories in nature between parents or grandparents and their youngsters. 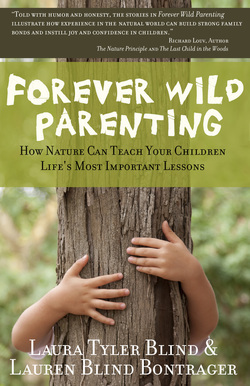 Our newly released book, Forever Wild Parenting shares stories from our own childhood, parenting wisdom, and activities at the end of each chapter to help you create your own forever wild experience with your family. As a mother-daughter team, Laura and Lauren’s heart-gripping real life stories reveal how one family took the road less traveled and how it has made all the difference in their connection, friendship, and bond. Step into the unforgettable adventures and be inspired to create your own forever wild experiences with the youngsters in your family. Discover how to put unstructured, meaningful play back into your children’s day-to-day life. You’ll learn to spot the “teachable moments” from a mile away and will begin to create the pristine learning environments for your children to experientially retain the wisdom that is theirs for the taking. Best of all, you’ll watch your children develop into the adults you have dreamed they’d become, through an unhindered exposure to life’s natural lessons. Activities at the end of each chapter provide you the tools and inspiration to create your own forever wild experiences with your family. Through her “musing moments” Lauren creates the space to contemplate how to bring your own wisdom into your parenting journey. You’ll be starting your own family traditions in the outdoors in no time.